Premium Compatible Label Tapes for the Dymo LabelWriter 310 printer. The Dymo LabelWriter 310 label maker is ideal for the offices and small businesses that need fast printing and professional quality labels. This machine uses direct thermal printing technology means there is no need for ribbons, ink cartridges or toners. The compact printer takes up little space on desktops as this model measures 9.8 x 71. X 5.5 inches and weighs around 1.36 kgs. It has silver and blue housing and has a convenient design for quick replacement of Dymo LabelWriter 310 Label Tapes. The printer can handle labels as wide as 1 and ½ inches. The printer is able to deliver professional labels as it has a maximum resolution of 300dpi. The printer has quick printing speed. It is able to deliver a single address label in as fast as 4 seconds. To improve uptime, this model can automatically capture addresses from favorite programs. So there is no need to retype for instant labels. It includes easy to use software for quick printing with computers. It can also print from other standard printer programs. The Dymo printer can use Wi-Fi or other networking connectivity options. 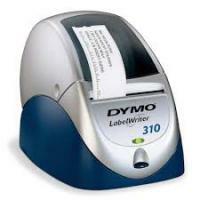 The Dymo LabelWriter 310 printer eliminates the inconvenience of printing labels with a desktop or network printer. It is easy to setup and use. The utilization of thermal print technology removes the need of ribbons, toner and ink cartridges. Q. Does Dymo Labelwriter 310 have a USB port? A. Yes. The Dymo Labelwriter has an inbuilt USB port that offers to connect to Mac and Windows platforms easily. Q. What accessories can I expect on purchase of Dymo Labelwriter 310? Do I require to buy the Dymo Labelwriter 310 label tapes separately? A. The Dymo Labelwriter 310 package contains the printer, USB cable, a power adaptor, one roll of the Dymo Labelwriter 310 label tape, Windows and Macintosh software installed on a CD and a booklet of quick start guide. All the basic requirements to start printing labels with the printer right away are included in the purchase which means you need not buy anything separately. Q. I have the Windows Me installed on my PC. So will the Dymo Labelwriter 310 work with this version? A. Yes. The Dymo Labelwriter 310 printer is compatible with Windows 98, Windows 2000, Windows Me, Windows XP, Macintosh OS X, Macintosh OS 8.6, Macintosh OS 9 and Macintosh OS 9.1 versions including some of the latest versions. Q. If I pay extra can you make an urgent delivery of the Dymo labelwriter 310 label tapes? A. We understand your needs. As we deliver all our orders through Fastway Couriers we need to maintain the schedules accordingly. If the order for Dymo Labelwriter 310 label tapes is made before 2 pm on weekdays it can be delivered the same day depending on the availability of the stock. Please contact us on 048 30833221 for urgent delivery. We will try to make it as fast as possible. For further information please visit the ‘DELIVERY’ section below. Q. I want to know whether the printhead in my Dymo labelwriter is working properly or not. So how should I go about with the procedure? If the printhead is functioning properly the labels will be printed with different line patterns and if there is a problem with the printhead you will see broken lines or gaps on the label while the self test is on. Q. Is there any problem if I use metallic or fluorescent inks on the Dymo Labelwriter 310 label tapes? A. The metallic and fluorescent inks can be used on the areas of the labels where the printer does not print. The Dymo Labelwriter 310 label tapes cannot be used for flood coating purposes.